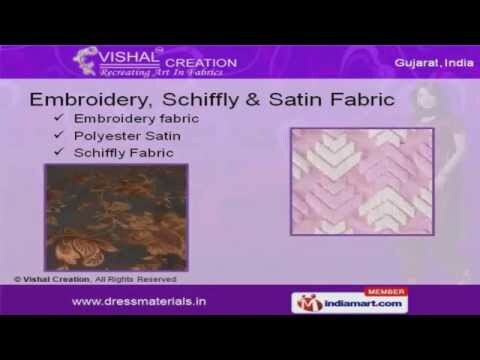 Welcome to Vishal Creation, Manufacturer and Exporter of Salwar Kameez and Dress Materials. The company was established in 1993 at Surat. State-of-the-art infrastructure and International quality standard helps us to grab maximum customer satisfaction. Stringent quality checks, Skilled and experienced workforce make us the first choice of our clients. We offer a wide array of Embroidery, Schiffly and Satin Fabric that are extremely reliable. Our Embroidery, Schiffly and Satin Fabric are one of the best in the market. We offer a wide variety of Georgette, Chiffon and Cotton Fabric that are best in the industry amongst others. Fancy and Designer Fabrics and Brocade offered by us are available at industry leading prices. We have been exceptionally able to offer to our customers our range of Jacquard, Blended, Burkha and Crepe Fabric. Along with that we offer Dress Material, Blossom and Ladies Wear that are a class apart.